bl.uk > Online Gallery Home	> Online exhibitions	> Asia, Pacific and Africa Collections	> An ayah. 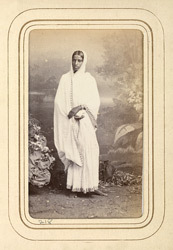 Full-length standing carte-de-visite portrait of an ayah, one of a series of prints of ethnic types and occupations taken by Bourne and Shepherd in the early 1870s. An Ayah was used for a maid or a nurse maid. The word has been adopted in many Indian vernacular languages but it comes from a Portuguese word aia, which meant a nurse or governess.